Assigned to the early 'Ggantija' phase. This site has been Radio-carbon dated to about 3,300 BC. 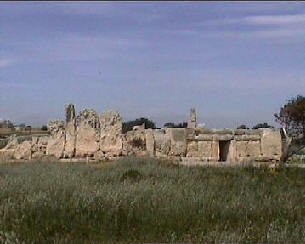 It is paired with the nearby Mnajdra temple complex. 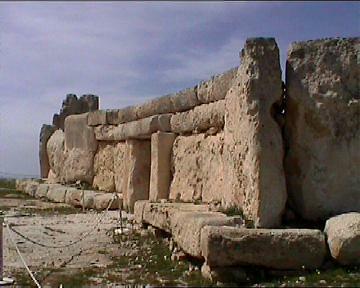 Hagar Qim, along with nearby Mnajdra, have now been covered over with a permanent protective cover because of the serious deterioration of the monuments. 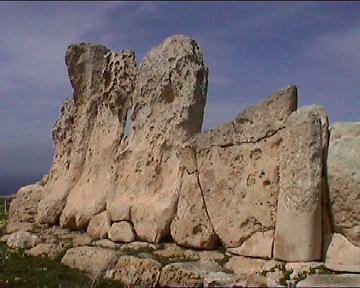 Hagar Qim is one of the most impressive temples on Malta. 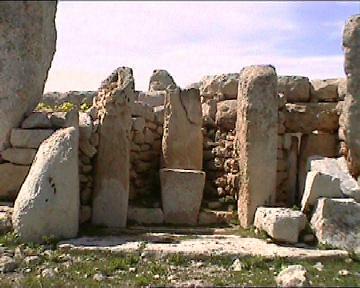 Enough of the original features remain to visualise the structure as it would have looked to the prehistoric inhabitants of Malta. 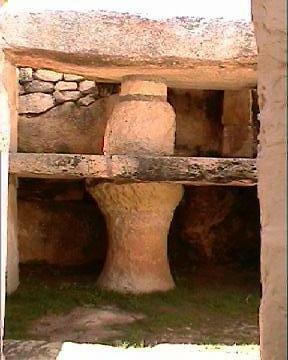 While it is proposed that all the Maltese temples were once covered over with stone roofs, there are no records of discoveries of collapsed ceilings in the archaeological reports. The impressive temple facade. 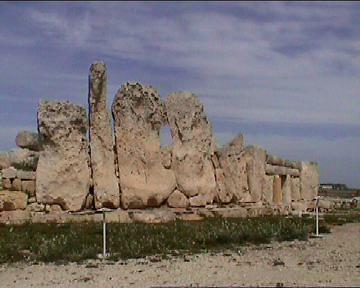 The larger stones give an idea of the original height of the temple, which would have been almost double what it is today. The temples in the process of being covered over (2009). 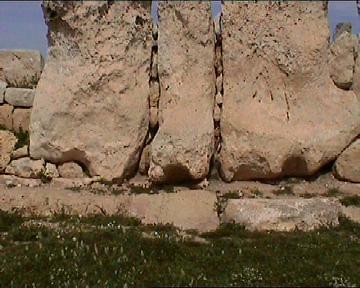 Close-ups of the huge kerb stones that run around the front of the temple and the huge weathered limestone blocks of the front face. 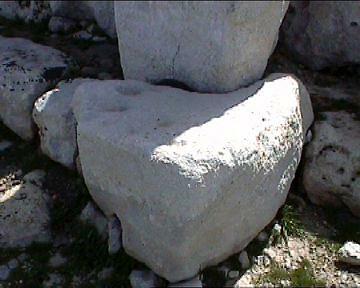 The sockets at the bottom of the stones are believed to have been used to lever the larger stones upright. 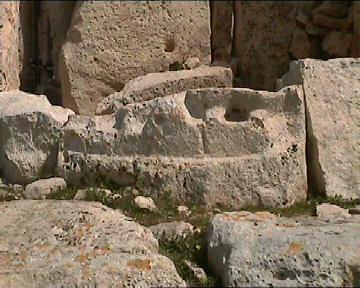 On the Eastern side of the temple, the remains of a statue can be seen. It is believed to be the base of two missing 'mother-goddess' statues. A cache of small Mother-goddess statuettes was also found under a step inside the temple, is now on display at Valletta museum of Archaeology. Facing North-East is a contrasting (and unique) 5.2m high menhir, sometimes referred to as a 'phallic shrine'. The carved 'support stone' at its base is an unusual feature as other menhir's are usually bedded directly into the ground by 10 - 20%. of their length. 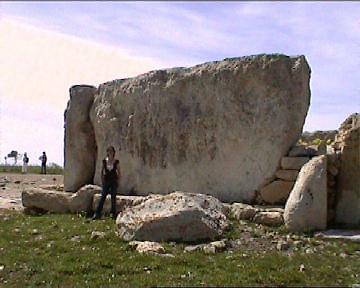 The largest stone at the temple, and possibly all of Malta, is found in the Northern wall of this temple; It is over 7m long, and is estimated to weigh about 70 tons. A selection of stone holes from the site. 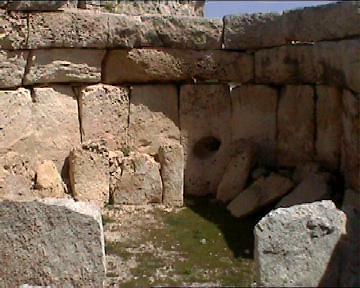 Within the Temple are two alters, supported by 'mushroom' shaped stones. It has been suggested that these indicate the use of hallucinogens. 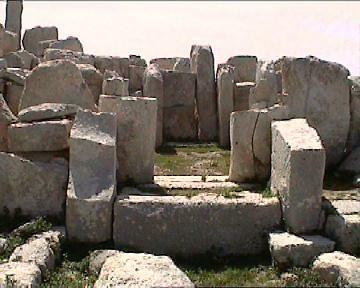 Although there are plenty other 'mushrooms' at nearby Mnajdra (above), raising the question of who is hallucinating what? 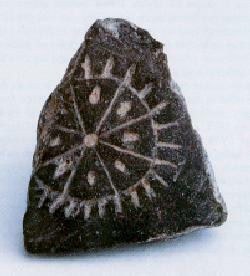 This fragment of pottery (right), with a solar wheel on it was found at Hagar Qim. It is on display in the National Museum of Archaeology, Valletta. The site has an Equinoxial alignment to the alter stone inside the holiest of holies. 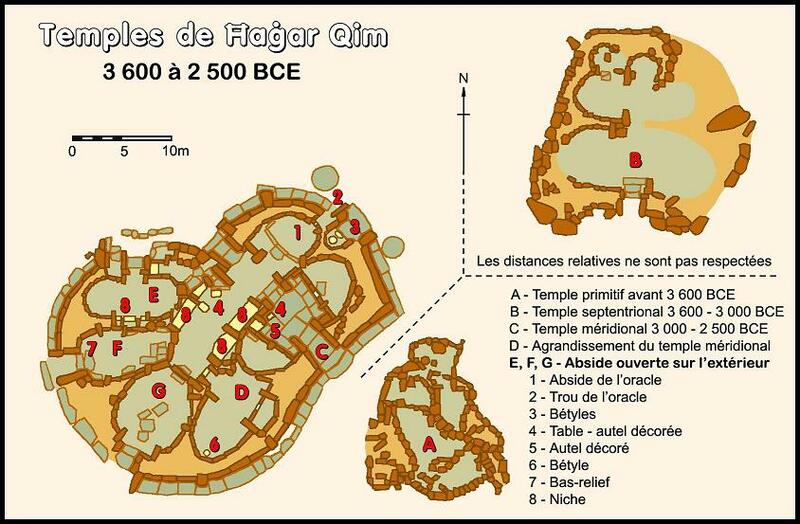 "The Ħaġar Qim Complex was built in three different stages, thousands of years apart. So far apart in fact, that changes in working practices occurred between stages. When the first, small temple was built they had no flint tools. 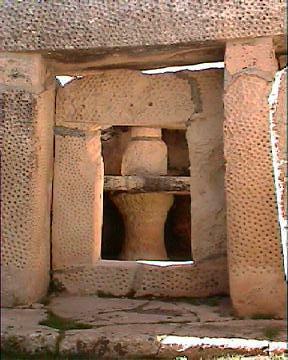 they used only chunks of lower coralline limestone as tools to cut and work the blocks of stone used to build this temple. Such tools were found in the fields surrounding the temples. This temple was built with its entrance facing almost directly South, towards the midday Sun. The second temple was built thousands of years later when they had better tools to work the globigerina limestone. It was built with its entrance facing directly North. With the first temple it seems that they were still looking for a good astronomical direction. Now it seems that they had improved with their choice. But it was not yet a good one; the hard northerly wind was very cruel. They had to block the entrance with rotating sheets like our doors. It was smaller than the first temple. The first temple was built in the form of their squatting god. Two oval chapels, one behind the other with three niches at the back, facing the entrance. This shape gave the form of seven apses inside the temple, one for each of their gods. Seven continued to be their holy number throughout all their constructions, including the wells for their water at Misqa. This second temple was also built in the form of their idols, with two oval chapels, one behind the other with some apses at the back, facing the entrance. The passage from the first chapel into the second is flanked by a decorated altar on each side with a passage between them, about five feet wide. This passage is closed with blocks of stone that do not fit perfectly. this shows that this closure was not in the original construction. When they constructed the third and last part of the temple, they annexed the back chapel of the second temple and incorporated it in the third temple, closing the middle passage. By the time they had constructed the third temple they had learnt a lot about astronomy. 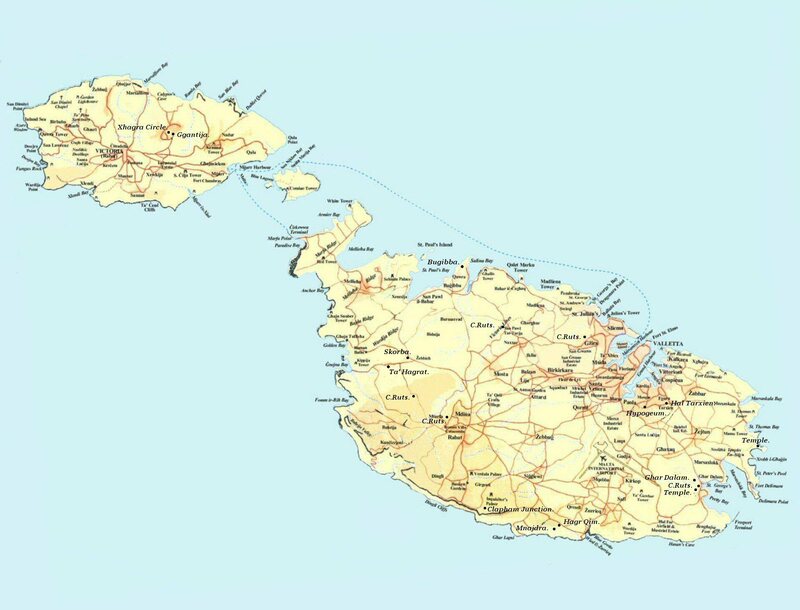 they had discovered the position of the major standstill of the Moon, towards which they then built the main entrance of all their main temples: Ħaġar Qim, Mnajdra, Ggantija, Tarxien and Ta' Ħaġrat. They also made doorways in their buildings that face important directions in astronomy. 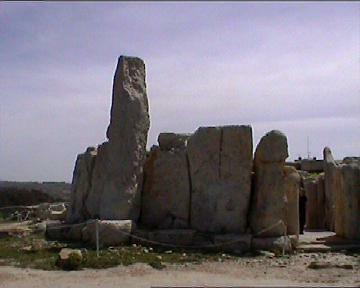 At Ħaġar Qim, the chapel they had annexed from the second temple, being at a right angle to the main entrance of the second temple, meant the opening of a doorway towards the West had to be directly facing the West or the setting of the Sun at the Equinox. They also built a high-floored room from where they could watch the setting of the Sun at the Summer Solstice, over the top of the hill of Ta'l-Gholja. From the opposite direction they could watch the rising of the Sun during the Winter Solstice through a window in the front wall of the temple - but wise modern archæologists have closed this gap with artificial stone. (5) the rising of the Sun at the Winter Solstice from the opposite direction through a window in the front wall of the temple. As said earlier, these three temples were built in three different periods, thousands of years apart. Proof of this comes from the layers of flooring used in the corresponding temples. The first small temple was given a layer when it was built. When the second temple was built and was given flooring, the first temple was given a second layer. Later, when the third temple was ready and was given a layer of flooring, another layer was given to the second temple and a third layer to the oldest, first temple. 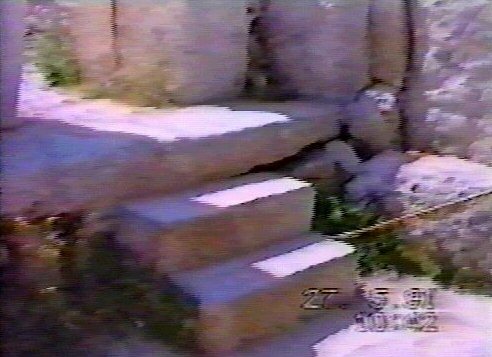 Here we notice that the upright orthostats of the first temple were, inside the temple, smoothed up to the top of the top layer of flooring. This proves that the wall of the oldest temple was built before flint, which was discovered after the laying of the third layer of flooring, came into local use. 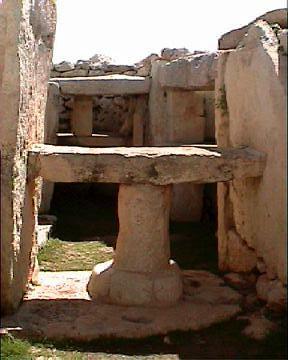 This also proves that this temple is the oldest in Malta and the world - and older than Ta' Ħaġrat. This small derelict temple, left to disintegrate under trees and shrubs, is the oldest man-made free-standing stone construction in the world. The claim that the entrances of the temples are aligned towards the Sun when they are 10 degrees further South is a naïve idea. That direction, 10 degrees further South than the Solstice, is exactly in the direction of the Moon. Also, the idea that the Sun shone through the so called 'oracle hole' is wrong, because outside the 'oracle hole' there was a chapel for women who were not allowed to enter the temple proper. The name 'oracle hole' is a misnomer. The women had this chapel reserved for them just outside the main temple. 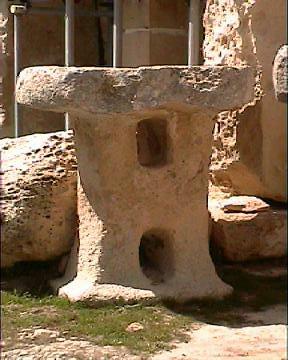 There is this one at Ħaġar Qim and another one like this, but larger and better constructed, at Tarxien. 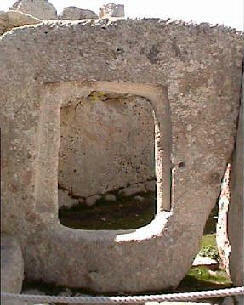 The associated 'oracle hole' was for the transmission of sound from the inside of the temple into the women's chapel outside. These temples were built by experts in acoustics. As an example of this, there is a sound amplifier built out of solid rock at the Hypogeum. 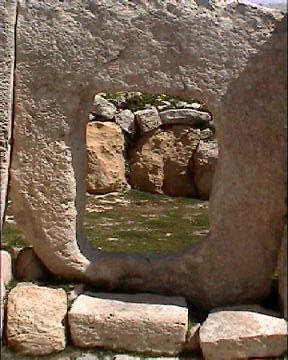 At Ħaġar Qim, they passed the sound through a hole, about one foot in diameter, by effective sound reflections. At Tarxien, they had a big gap high up in the wall. So the term 'oracle hole' should be changed to 'transmission hole'. I mentioned the 'oracle hole' because that is the name by which it is nowadays known, but in the Stone Age, there were no oracles. They only existed in Rome, Greece and Egypt. But our archæologists are so imbued with the idea of the 'oracle' that, wherever they see a hole for a window, they lablel it an 'oracle hole'. 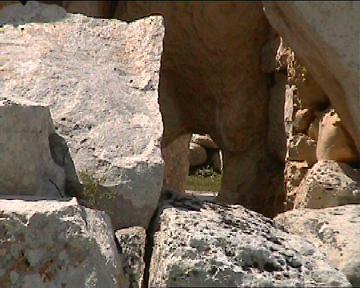 In fact, there are several such holes in Mnajdra. One of them is in the bedroom of the chief priest, who had a baby sleeping inside and whose skeleton was discovered furing the first excavation. In this high priest's bedroom were three beds, one on top of the other, like a three-tier bunk. 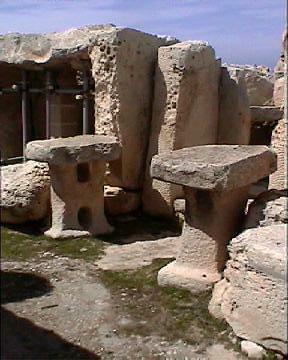 These beds were destroyed during the first crumbling of the Mnajdra temple in 1994. 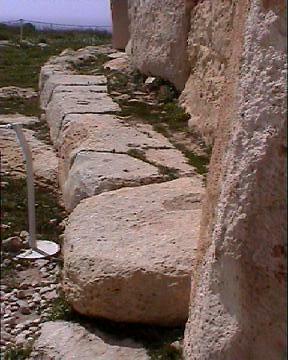 These flat beds also had another purpose, that of supporting the walls of the temples. These beds have not been replaced. My great-great-grandfather was one of the excavators who saw the baby skeleton in the niche, and told us about it. Lately, we heard the news that some foreign students laughed when they were told that the statue inside the information office in Valletta was the Goddess of Fertility, and when those intelligent students saw that it had no female breasts, they started laughing. Who knows how many tourists, the intelligent ones, laugh at our ideas and ridiculous opinions. But it is only the indoctrinated guides who may 'explain' such matters to the tourists. I am not permitted, by law, to speak the truth on archæology to tourists" in a group of five persons or more! 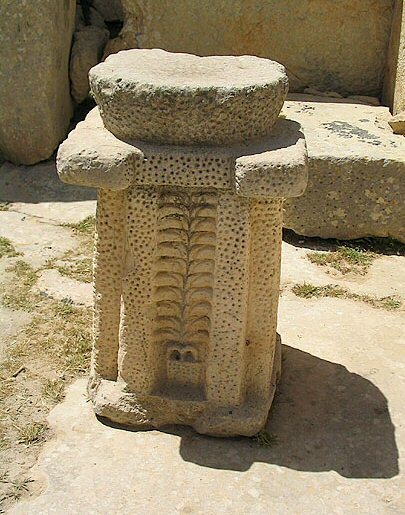 A carved stone 'alter' or statuette-pillar with the 'tree of life' motif - in a plant pot.